Regular yoga classes & next six week session Jan 7 - Feb 17. Classes are ongoing so you can start our yoga classes at anytime. Special promotion for Newcomers - unlimited classes for 2 weeks for $25 during this 6 week period. A NEW YOU NEW YEAR 30 Day Challenge starting Jan 7, 14 and Feb 4. Take unlimited yoga classes for 30 days while you participate in the 30 Days to Healthy Living Program at 40% off unlimited yoga classes ($80) and 40-50% off nutritional products used in the program ($260.44 for preferred clients (PC); Plus $29 PC membership for 1 year ; $222 for consultants; Plus $49 consultant membership for 1 year). 30 Days to Healthy Living Program is based on eating clean nutrient dense wholefoods, eliminating allergic and addictive foods from your diet and jump starting your eliminative organs to promote optimal health. This program is jumpstart a healthy lifestyle. Boot camps start the 1st and 3rd Monday of the month. Meal plans and recipes for vegetarians and omnivores, education and support in closed FB group (opens 7 days prior to the start of the program) plus coaching. Nutritional products used in the program must be purchased 5-7 days in advance to be in your hands for the start of the program. Contact Kimberly at 304 276-4956 to learn more and for enrollment and ordering of your nutritional products. The Mindfulness-Based Stress Reduction Program This eight week course based on mindfulness meditation and transforming unconscious reactions into conscious responses takes place on Thursdays from 7-9 pm and has 22 hrs of teaching including a silent 6 hr retreat on the weekend. Registration required. No drop-ins permitted. Date TBA. Please let us know of your interest. Yoga Teacher Training Program Monthly mentoring sessions with Junior Intermediate III Iyengar Yoga teacher, Siegfried Bleher on Saturday afternoons from 1-4 pm once per month on Jan 26, Feb 23, Mar 23, Apr 13, May 25, June 22, Sept 21, Oct 12, Nov 16, Dec 13. Let us know of your interest. If you are looking for a place that aspires to teach the art and science of optimal living, you have come to the right place! At Inner Life Yoga Studio, our students achieve optimal health and well-being through Iyengar yoga and holistic lifestyle practices. These practices include learning yoga poses (asanas) , breathing practices (pranayama) and meditation, as well as whole foods nutrition, mindful living, and the use of pure, safe and beneficial personal care products. We teach all ages and all levels, as well as those with special needs--pregnant women, people in pain, poor health, or overweight and special interests - athletics, high performance and stress reduction. There is an emphasis on learning the fundamentals of how to perform yoga poses and their step-by-step progression. This yields maximum benefits and achievements for the student, as well as preparation for the advanced practices of pranayama and meditation. 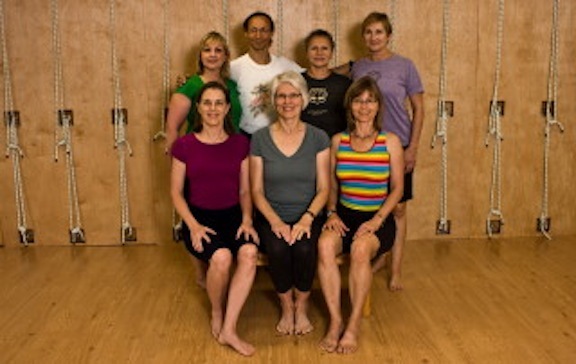 Our highly qualified instructors teach the many ways of practicing Iyengar yoga including vinyasa, restorative yoga, and classical asanas (poses) and pranayama (breathing practices). Yoga philosophy is integrated into the higher level asana classes and workshops. We help our students overcome pain and symptoms of dis-ease through our yoga therapy and 50-plus programs. Optimal function and higher states of mind and emotional intelligence can be reached through our regular classes, privates, personal training and coaching sessions. Our goal is to meet students where they are, tailor their practice to their needs and aspirations, and help them achieve their desire for high level wellness in the many dimensions of their lives. We also mentor individuals who aspire to become yoga teachers and prepare them for the certification exams governed by the Iyengar National Association of the United States. Please complete the survey below and let us know how we can best serve your aspirations for optimal living! If you have any additional questions, or would like to speak with one of us on the phone, please call us at 304 276-4956.